The 7 Step Quartz polishing system by Weha is a polishing pad system designed to give fabricators the ability to work on virtually every stone surface. One of the noticeable characteristics on the Quartz 7 Step pads is the resin pattern. This Geometric Water Displacement Technology Pattern offers highly desired traits. Additionally, these traits are important to stone fabrication professionals. The improved geo pattern offered by this polishing pad increases the durability of the outer segments. Are you tired of your outer segments coming off? If so, you’ll find this pad to be the answer because of its geometric pattern. The geometric pattern on this polishing pad also makes for better stone contact. This is because it is designed to channel more water away from the surface of the stone. As a result, this reduces the amount of water that collects between the pad and the stone. Additionally, reducing hydroplaning causes the polishing pads to have more “bite”. So, the polishing process is more efficient. The best polishing pads for quartz have a light colored resin to protect the stone from polishing marks. Also, a polishing pad considered to be the “best in its class” should be versatile and work well on a variety materials. The Quartz 7 Step Polishing System meets those requirements. 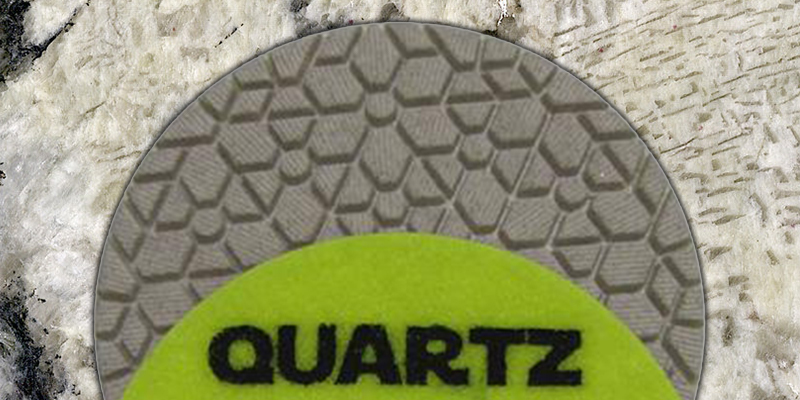 The white resin used in the Quartz 7 Step polishing pad is a great choice for fabrication pros. Hence, this design choice was made to prevent bleeding on quartz and other engineered stone materials. Light resin is best for stones that are a light color. However, there is more to getting a high performing pad than just correcting bleeding. Diamond concentration is also a factor. A major key to getting a high gloss polish is the diamond concentration in the polishing pad. So ,the Quartz Polishing 7 Step System offers a high diamond concentration in each grit. This yields the high gloss finish that one would expect from a “best in class” polishing pad. Have you struggled to find a go-to polishing system for quartz or other engineered stone materials? You may want to consider giving this polishing pad set an opportunity to impress you.